During the months of January and February, Fridays are for winter sports! 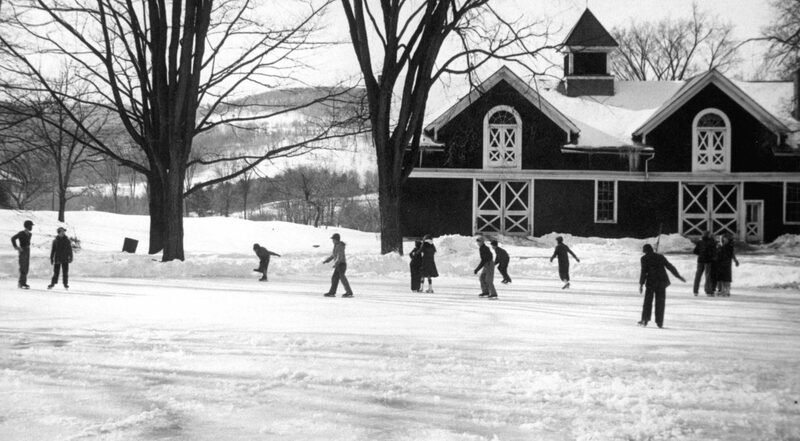 On these days, weather permitting, students leave mid-morning to spend the day enjoying the best of winter: by downhill skiing, snowboarding, Nordic skiing, or ice skating! It’s a tradition that dates back decades. For many of our students, it’s foundational. The program allows them to master lifelong skills, but also to feel the thrill that comes from whizzing down slopes or gliding over ice. And there’s no better way to boost community than to have these experiences in the company of teachers and friends of all ages. Indeed, when Pine Cobble alumni think back on their experiences here, their fondest memories are often related to winter sports. Downhill skiing/snowboarding: students and teachers travel together to Jiminy Peak in Hancock. Under the watchful eye of teachers, older students are assigned as “buddies” to younger students and help them carry and keep track of equipment. While at the mountain, they get formal classes with professional ski instructors, as well as informal time on the slopes in teacher-led groups according to ability and confidence levels. Our oldest students — sixth grade and up — are able to earn the privilege of skiing with their peers. Skating: Students travel to the skating rink in North Adams, where they receive formal lessons, and have an array of open skating time. Our students become competent skaters by the end of the program. Cross-country skiing: There are few places as beautiful as Prospect Mountain in Woodford, Vermont! Instruction is provided by our teachers and students become solid Nordic skiers by the end of the season.